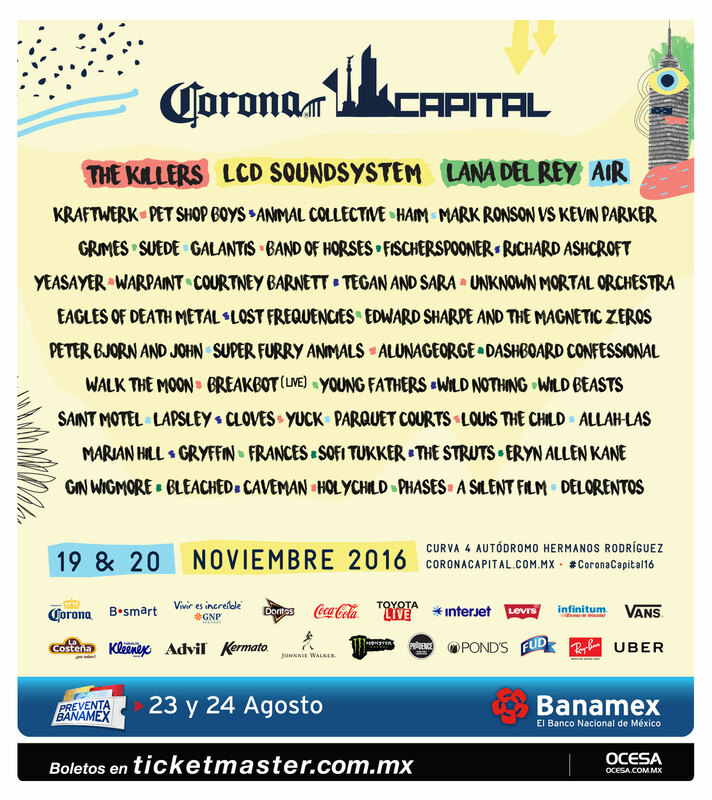 Mexico City’s Corona Capital has revealed its 2016 lineup. The annual two-day music festival takes place November 19th – 20th at Autódromo Hermanos Rodríguez. The impressive lineup boasts LCD Soundsystem, Kraftwerk, The Killers, Lana Del Rey, Air, Grimes, HAIM, Pet Shop Boys, Animal Collective, Fischerspooner, Band of Horses, Richard Ashcroft, Suede, Courtney Barnett, Tegan and Sara, Warpaint, Eagles of Death Metal, Yeasayer, Unknown Mortal Orchestra, Peter Bjorn and John, Edward Sharpe and the Magnetic Zeros, Dashboard Confessional, Super Furry Animals, Wild Beasts, Låpsley, Parquet Courts, Yuck, Wild Nothing, AlunaGeorge, Bleached, and The Struts. Plus, Tame Impala’s Kevin Parker and super producer Mark Ronson will face off in a DJ set. Ticketing info and other details can be found on the festival’s website.